Of the many patterns of 13 Star flags that exist, this particular pattern of 12 stars in the shape of a square and a single center star is among the rarest. Known as the Trumbull pattern after Revolutionary War patriot and artist John Trumbull, who painted this configuration of stars in at least three of his works: The Battle of Princeton (1777), The Surrender of General Burgoyne at Saratoga, New York (1777) and The Surrender of Lord Cornwallis at Yorktown, Virginia, (1781). Although it is unknown historically if this pattern of flag was actually present at these battles, Trumbull served as second personal aide to George Washington and deputy adjutant-general for General Horatio Gates, and had deep first-hand knowledge of the war and the flags that would have been flown. He also is known for meticulous attention to detail. Regardless of whether or not this pattern of flag was actually present on these battlefields, the pattern has become permanently associated with his name. 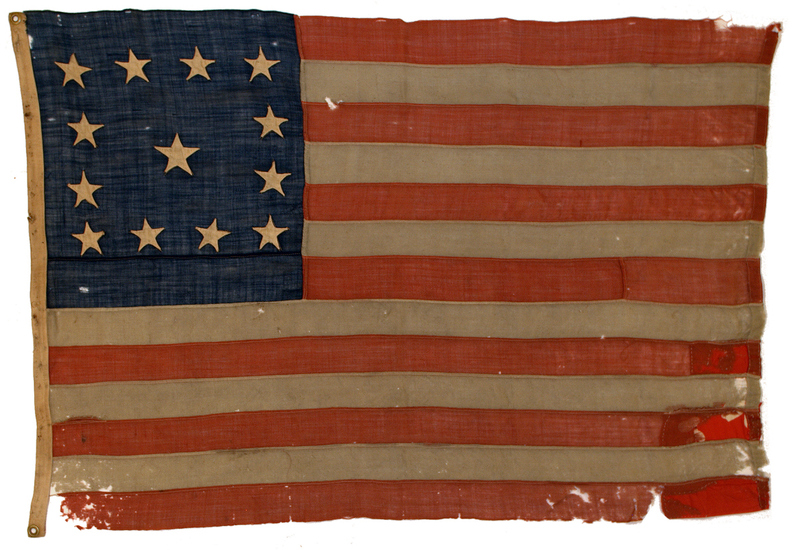 This early Trumbull pattern flag is very rare. Most likely, there are perhaps five or fewer Trumbull pattern 13 star flags of a sewn construction known to exist. This particular example is exceptionally beautiful among known examples, due to its wonderfully traditional coloration and aged appearance. It truly is a gem of an American flag. The flag has been lovingly cared for and carefully patched, including the bottom corner of the fly end, which was repaired with patterned dress fabric. The entire flag is treadle sewn, and the double-applique cotton stars are aligned and sewn with a lineal machine stitch. The center star is slightly larger than the outer stars, and is perfectly centered and vertically aligned on the canton. The flag is unusually small for flags of the period, yet another appealing attribute of this rare and beautiful flag.